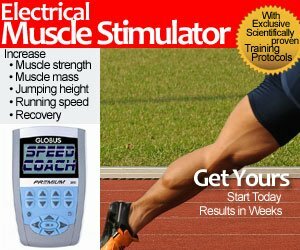 Question for Sprinters: Is your weight training session before or after the running workout? I discussed weight training in several past weight training articles, as well as my Fireside chat with Derek Hansen. I personally prefer doing my weight sessions after my runs, after changing my T-shirt, of course . Nothing worse than having a sweaty bench press apparatus for the next guy! No need for a warm up, just rack the bar and GO! But if you do your weight session first thing in the morning, or before your runs, you’ll need to warm up first! 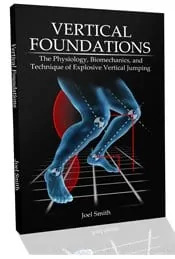 Last month, Joel Smith, Assistant Strength Coach of Olympic Sports at the University of California, Berkeley and founder of www.just-fly-sports.com wrote the controversial article 3 Reasons the Squat is NOT the Cornerstone of Strength Training for Sprinters (a recommended read). He is also the author of the new book Vertical Foundations. Click here to learn more about the book. Here is the video on YouTube with full descriptions below with 3 great warm-up exercises for strength training. I have a specific series of “movement prep” exercises that I employ as a warm-up to the weight room. These movement prep series can be as many as 12 exercises or more. Oftentimes my athletes are coming straight from the track, so they are pretty warmed up by the time they come through the weight room doors. Because of this, I keep their movement prep warm-up fairly small. 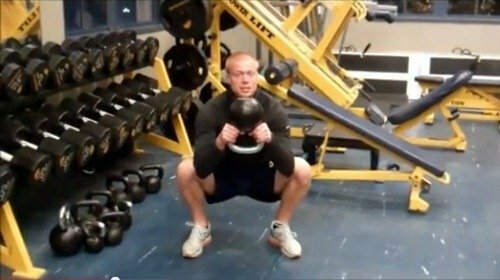 Three exercises I always use that I feel cover the prime movement patterns of strength training are the goblet squat, kettlebell swing, and windmill. These exercises combine movement patterns with strength and mobility, and are therefore an integral part of maintaining a healthy athletic state. The purpose of the goblet squat is simple: teach athletes how to squat in a mobile manner! For the goblet squat, I instruct a slightly wider than shoulder width stance with the feet turned very slightly out. The athlete has a kettlebell or dumbbell (doesn’t matter which) against their chest and sits back into a deep squat. At the bottom of the squat, when the legs are just below parallel, the athlete will push their knees out with their elbows, which helps place more torque on the hip joint and stabilizes the lumbar spine. It also loosens up the groin (a tight groin causes valgus during squatting). The athlete also should attempt to make the torso as “long” as possible at the bottom, stretching their spine and pulling their head away from the pelvis. For the up phase of the lift, the athlete should form a “claw” by pressing their big toe toward the heel, activate the glutes, and raise up. A lot of technique for a simple lift! Although it sounds exhausting, beginners catch on to this lift fairly easily. This is an incredible movement in the weight room that helps athletes master the hip hinge and unlock the power of their posterior chain. For the kettlebell swing, the athlete will keep the shins fairly vertical and swing the kettlebell directly at their crotch, sitting their hips backwards at the last second and “hike passing” the kettlebell underneath themselves. For the way back up, the athlete quickly exhales and slams the hips forwards, popping the kettlebell up to eye level. Mistakes here are swinging the kettlebell too low or bringing the knees forward over the toes. Both of these errors are symptoms of “knee dominant” athletes or those athletes who haven’t learned to use their posterior chain properly. A prerequisite to the swing is learning how to hinge the body forward at the hips without bending the back. Oftentimes, I’ll run athletes though the hip hinge with a dowel rod prior to doing swings. The windmill is a borrowed yoga exercise that the strength training world has adapted, particularly the kettlebell crowd. For the triangle pose, the athlete stands and spreads the feet about 3 feet apart, forming an upside down “Y”. The feet must point straight forward and not out to the sides to fully engage the spiraling fascial line the exercise is designed to target, which extends all the way down to the peroneals of the lower leg. A kettlebell will be held over the head, and the athlete descends laterally, reaching their free hand behind the knee of the opposite leg of the hand holding the weight overhead. A stretch should be felt in the lower torso, hamstrings and groin area. Athletes accomplished at this stretch should be able to touch the ground without bending their knees and keeping their feet straight ahead.